History of the Saluki, the origins of the breed. Just about every breed of dog has a documented man-made origin. The Saluki does not. Almost every breed of dog can be traced to an irrefutable source. The Saluki can not. The Saluki's origins, geographic location, time, predecessors -- are all shrouded in mystery and myth. 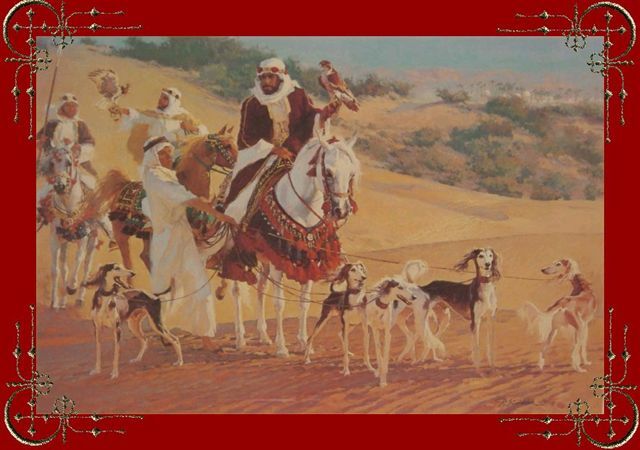 What is accepted as fact is that the Saluki has been associated with the Middle East since antiquity, and that in pre- and recorded history it has been used for hunting. A rich visual record of the breed goes back at least 5,000 years. At archaeological sites in many areas of the Middle East, ancient images of Salukis have been found on seals, in tomb paintings, mosaics, sculptures, and on household objects. The breed was held in great esteem, called "el hor" (The Noble) by the Arabs and was bred as carefully as the famous Arabian horses, with speed and endurance in mind. Valued and honored companion to Egyptian nobility, the Saluki could well be called "the royal dog of Egypt", and was known to be mummified like the Egyptian Pharaohs. The Saluki occupies a unique position in the lives of its Eastern, often Muslim, owners. Ordinary dogs are considered "unclean" and may not be touched, but the Saluki is permitted into the tents of nomads and the courtyards of settled breeders. Prior to and during the 10th century, hunting poetry extolled not only the prowess of the breed in the chase, but its physical attributes and companionship. The Saluki retains this esteem even today and continues to be valued and used for hunting in most of the regions where it traditionally worked, side by side with its master, as a source of pleasure for its beauty and athleticism. This is a testimony of the Saluki's enduring value to those who created it.